Is Globalization in Electronics Inevitable? In those moments when we’re not frantically trying to keep up with all that keeps us awake at night, it’s easy to pine for a time when your world was limited in scope and you knew your friends by name rather than by avatar and you knew where your food and your shoes and your tractor came from. Of course, it’s all too easy to romanticize the past, and certainly not everyone has that yearning. But enough of it exists to stoke things like the Slow Food movement and a specific neologism, the locavore – someone who tries, as much as possible, to eat food grown locally. The question is, can that sensibility be extended beyond food? Can we make stuff locally too, in a way that is accessible to everyday people (instead of just boutiquey things for those with too much cash burning a hole in their pockets)? The obvious answer, obtained simply by looking at how things are, is, “No.” If your competitor builds locally and has to sell for $100 and you can sell more or less the same thing for $20, your competitor won’t last long. Even if you sell for the same price, if your profit is four times that of the competition, then you’ll win by having more fancy cars – or even by hiring more people and taking the business further faster. But, over the last few months, I had a chance to take a look at a specific example of someone trying this out. As you might expect, it’s a young guy, still living with his parents, fire in the belly and high aspirations. His ardor hasn’t yet been smothered by the “it can’t be done” conventional wisdom. The real test, however, is whether he can prove that it can indeed be done, or whether he’ll eventually learn what everyone else has already figured out. The guy is Adam Wegener, and his business is called TrashAmps. I learned about him from my daughter last Christmas. Adam had a kiosk in a local major mall and, through a combination of a flashy-looking product and topical environmental messaging, was doing a brisk business. 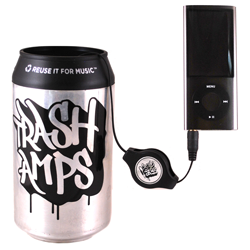 The product was a small speaker and amplifier stuffed into a repurposed aluminum soda can with the top removed. The message was about sustainability: as I heard it on Christmas, these speakers were made out of recycled materials and were built locally. A true locavore’s dream. But some friends of mine started questioning just how green things were when they visited the website: it looked to them more like a standard speaker simply housed in a recycled can. That’s not much recycled content. So I got in touch with Adam right after the holidays. I wanted to understand better both the current level of “sustainability” and his plans going forward. Is this working? More importantly, can it scale? Are there things that others could learn? As it turns out, the speakers themselves come from China – apparently all speakers do (at least at the compact end). The can is recycled, and they cut the packaging themselves from recycled cardboard with a laser cutter. The board is made locally (in the Bay Area), and they did some of the soldering themselves. When we talked for the first time, they had just finished selling out their stock and were figuring out what to do next. I got back in touch in May to see how those decisions were going. And he’s been tossed headlong into the basic problems everyone else has. First of all, his speakers aren’t that expensive and they’re seeing good demand for them at music festivals. But he is also hearing that some people would like lower prices. He doesn’t want to live with his parents forever (he has been bitten by the new American Dream: actually being able to move out of your parents’ house using your own money), and he isn’t sure he wants to dedicate his life to cutting packaging and soldering the last bits of the board. What to do? The first reality comes in accounting for the full cost. Originally he wasn’t including himself in the labor cost. Doing things the way he does, the packaging is essentially free. He gets surplus parts from a local surplus store; pricing is good, but it’s not always a reliable way to scale. He’s also done some work to reduce material costs. For example, the speakers used to go through several layers of distributor; now he goes direct. His next round of boards is being built in the US, but by a company with fabs in China. These efforts have reduced his cost by over 50%. He’s still having them assembled locally, even though it’s at a higher cost than offshoring. Then there is his own time to account for. He and a friend have worked on the final build time to figure out how long it should take per piece, and what that equates to in dollars here and elsewhere. Done locally, that labor adds another 40% or so to the current materials cost. That’s a hefty chunk, and the materials costs – the board and assembly – would also be much cheaper if completely outsourced. And so comes the conundrum. Doing things locally in a “sustainable” fashion (relatively) means paying himself (enough to move out into his own place) or someone else. It means paying more for the boards and other materials. It means establishing a more reliable and less labor-intensive supply chain for the recycled materials and other surplus stuff they use now. The upside is that they can market their product with a sustainability message. On the other hand, he could bite the bullet and do what everyone else has done: offshore this stuff. All the dollars go in the right direction because he can both charge less and make more. However, if part of his brand value is sustainability, then he loses his differentiation. Another option he’s considering is having two brands: the sustainable one and a cheaper one that doesn’t count on the green messaging. This is a particularly interesting exercise, since, if he wants, he’ll be able to measure the value of sustainability. Will customers pay 10% more? 50% more? Perhaps no more? In the end, does low price trump everything else? And even if he finds that value point, there’s still temptation in that the cheaper version may have higher margins, even on an absolute-dollar basis. This could seduce him into de-emphasizing – and maybe even jettisoning outright – the “sustainable” brand and focusing on the one that makes him more money. This two-pronged approach sounds like the most likely direction at this point. Critical decisions will be made after the next build, which consists of a larger chunk units to be sold at a variety of events over the summer. I plan to check in with him again next year to see how things are going. But it’s looking more and more like this sustainable product is one that can’t be economically scaled beyond the boutique level. That may come as no surprise to some of you, but it’s good that someone tests the conventional wisdom now and then. Even if the conventional wisdom ends up looking like the likely winner.